As 2017 fades out and draws to a close, I just wanted to take a moment to reflect on how far I have come with this crazy idea of being an indie author. Next, the Center I wished to book my physical launch was not available nor would it be for what seemed like decades, (not really but when you want what you want and it is not happening I tend to get a bit dramatic, 😛 ) and so I lucked out and the community emergency center had an opening which I quickly snatched up and began my preparations. 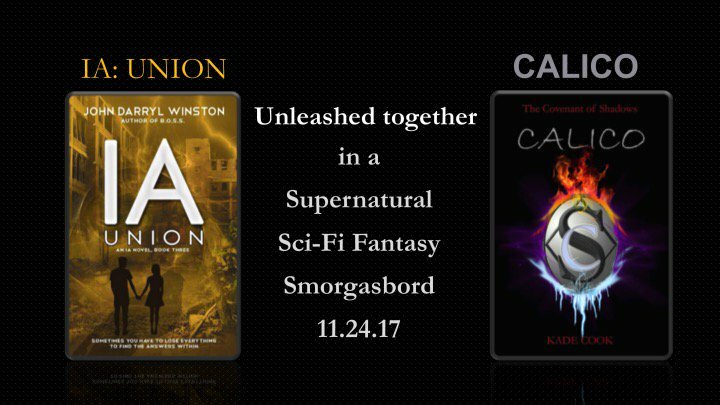 On November 24th, a wonderful friend of mine, an amazing YA&SciFi author, John Winston, joined forces to bring the world our duel releases, IA:Union and CALICO, which was a wonderful venture and one I look forward to doing again. Thank you John. On Nov 26th, the launch was held and so many beautiful souls came out to help me celebrate the birth of CALICO. It was an amazing night and so to all of you who took the time to be there, I thank you from the bottom of my heart. The following weekend, I took part in two craft fairs where I was welcomed with open arms, many smiles and tons of incredible questions…I even got a few hugs out of it, and a few new friends as well. At the beginning of December , myself and a few amazing authors decided to join the group Books4ANewGenerationChristmasEvent and donate a portion of sales, throughout the entire month of December, towards a much needed Charity called Reach- a program designed to help many people who are in need of prosthetic limbs. I very much am pleased to be part of this even though I was unable to do more online and interactive participation due to circumstances beyond my control but my heart was there with them and so is my donation. Somewhere within all the writing and the editing of Book two of TCOS, I found an amazing voice that was willing to be part of my supernatural world, and sign on to help me create the audiobook of GREY. Now finished and uploaded on the Amazon, Audible and ITunes platforms…GREY is alive and waiting for all to discover it. What an incredible thrill to hear another speak the words you have written and portray them as they sounded in your head. And so here we are, as the few moments quickly slip away and bring us closer to a new year, it allows us the opportunity to make a clean start, or if you are pleased like I am of how this year ended up an opportunity to push harder, to make more connections on the path I am traveling, to strengthen the already forged bonds that have been made and dream a little bigger, to climb a little higher on the mountain I call my future and to embrace every challenge that comes my way, to face it head on and to overcome them, as this time next year I can reflect once again to see how far I have come, living to dream and dreaming of the limitless skies filled with opportunity this new found world has brought me. So I say to all of you, take a quick moment to reflect. Ask yourself if you are further along or still waiting on things to be perfect before you take the steps toward what you dream of…just a word of warning to all who have delayed…time waits for no one so don’t delay too long. Lastly, I want to take this moment and say THANK YOU to all the beautiful and generous people who bought a book, e-book or audiobook of the TCOS Realm, your patronage means more to me then you will ever understand. You are my inspiration. If you want to start your TCOS journey now click here or want be part of new updates and special offers, sign up here.